OTTAWA — Longtime Conservative MP Tony Clement was forced out of his party caucus Wednesday, the day after he admitted to sending someone sexually explicit images and a video. He said in a statement issued Tuesday evening that he'd sent the images in the last three weeks to someone he believed to be a "consenting female" but who later demanded money if Clement didn't want them posted publicly. 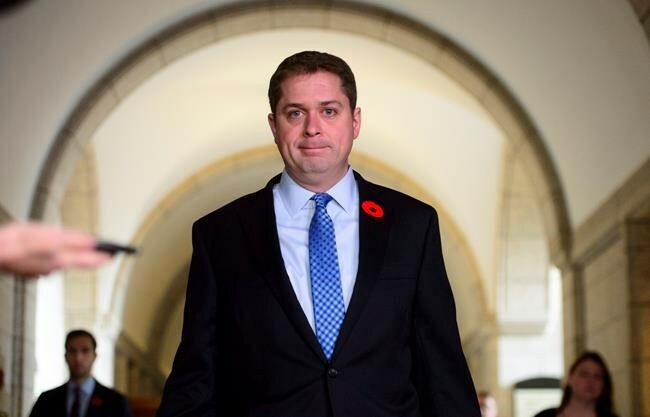 Initially Clement resigned only as the party's justice critic and from his committee roles; Conservative Leader Andrew Scheer didn't ask him to leave the party caucus. He said he was taking Clement at his word that the "terrible lapse in judgment" had been a one-time thing between two consenting adults. But after the story broke allegations washed over social media, largely from young women, that Clement's online behaviour was not so pure. He's long been known to be a prolific user of social media platforms like Twitter and Instagram. Several people online Wednesday said that Clement had used Instagram in particular to connect with numerous young women and message them privately. He spent a lot of time clicking to show he liked their photos. "New information became available today that suggest there are allegations that this is not an isolated incident and therefore I've asked Tony to resign from caucus and he has done so," Scheer said later in the day. He said the Conservative party has a code of conduct for MPs that he expects them to follow. “I don’t know that too many people ... have to be told not to share explicit images and videos with people that you haven’t met but obviously this is a terrible decision, extremely poor judgment," Scheer said. "We have to wait and see what happens in the short term as to what types of complaints are officially raised to obviously respond to that once it happens," he said. "There is a process on Parliament Hill with the human-resource officer so that is something that could very well happen." Clement did not respond to numerous attempts by The Canadian Press to comment on the allegations. However in an email to The Globe and Mail he denied harassing anyone on social media. "I would say I like all sorts of pictures on Instagram. I've never sent unsolicited harassing messages, ever," Clement wrote. Clement has also made some posts himself that included sexual overtones. He once posted a Valentine with his own caricature and the words: "Hey girl, come lobby this caucus member." Another time he publicly posted a picture of himself shirtless. Once a woman posted a picture on Instagram of a pump bottle of hand sanitzer in a little stand with arms and legs — "How cute is this adorable little Purell holder!" she captioned it. "I want to hug it and put its liquid contents on my hands," Clement replied. Of particular concern in Clement's case was the risk to national security when an MP with top security clearance opened himself up to an extortion attempt. Clement was an original member of the new National Security and Intelligence Committee of Parliamentarians, created in 2017 to oversee national security and intelligence activities carried out across the government. Scheer said both the RCMP and the security officials in the Privy Council Office were investigating to determine whether national security had been put at risk. He wouldn't say whether an investigation is underway to determine if any other MPs have been similarly targeted. Rennie Marcoux, the executive director of the committee secretariat, said all members of the committee hold Top Secret clearance and are permanently bound to secrecy under the Security of Information Act. He said shortly after being appointed to the committee, all members were given a comprehensive security briefing by the Privy Council Office and other security agencies. "In fact, we regularly review our security obligations given how important this is to our credibility," Marcoux said. In his original statement Clement said he had exercised "poor judgement" and would be getting treatment so it wouldn't happen again. He didn't specify what sort of treatment. He said he is extremely sorry to put his family through "needless pain and humiliation." Clement is married to Toronto lawyer and author Lynne Golding. They have three grown children. Golding issued a written statement Wednesday to the Parry Sound North Star. "As Tony mentioned in his statement, he will now be taking the action he needs to get help," she said. "I am hopeful that in time we will resume the happy life we shared with our family and friends." Clement is a well-known MP who has been part of the Ontario and federal conservative parties for several decades, both as an official and an elected MPP and MP. He was a cabinet minister at both the provincial and federal levels. He ran twice for the federal leadership, losing in 2004 and withdrawing from the 2017 contest early to support Maxime Bernier. In addition to his role on the national security and intelligence committee, Clement was the vice-chair of the House of Commons justice committee. — with files from Jim Bronskill.